Around this time last month, I had the opportunity to see Mamma Mia! in Novello Theatre in London's West End and today I want to share the experience. I decided to book through LOVEtheatre on my friend CL's recommendation (who purchased our Singin' in the Rain tickets). Somehow, it was less expansive to purchase the £68 package deal (including a complimentary afternoon tea at the Kingsway Hall Hotel) than just buying tickets to the show. Even more surprisingly, the stall seats (N row) included in the package were identical to the allocated seats for just booking the musical! As I reserved the afternoon tea for the same day as the musical, I needed to pick up the tickets in advance at the LOVEtheatre office (I could have paid postage and had the tickets mailed to me, but oh well). Thus early morning, I stopped by the office in Covent Garden with my booking confirmation to pick up the tickets. Rewind to a few hours earlier, the other two musical-attendees and I went for breakfast at Duck & Waffle (Read my previous detailed dining experience Here). The signature dish was as wonderful as always, even if it did feel a little heavy at 9am. We decided on a big breakfast since I tend to skip lunch when I have plans for afternoon tea. Around 3pm, my party arrived at Kingsway Hall Hotel and were led into the Harlequin Restaurant. In my past afternoon tea experiences (I wrote about two of them Here and Here), the server would always introduce each pastry. As that didn't happen here, I could only taste-guess what each of these pastries were. The coffee cheesecake and the blackberry pudding square were wonderful. The fruit tart, the dense walnut cake, the macaroon, and the cream eclair were good, but not extraordinary. While the scones were probably some of the best that I have ever had, the sandwiches were a bit of a let-down. The scones and pastries were all-you-can-eat, but we were set after the first-round. The fantastic service completes the dining experience and I am very pleased with afternoon tea at the Kingsway Hall Hotel. If you book directly with the hotel without a theatre package, I think it is a good value at £17.95. 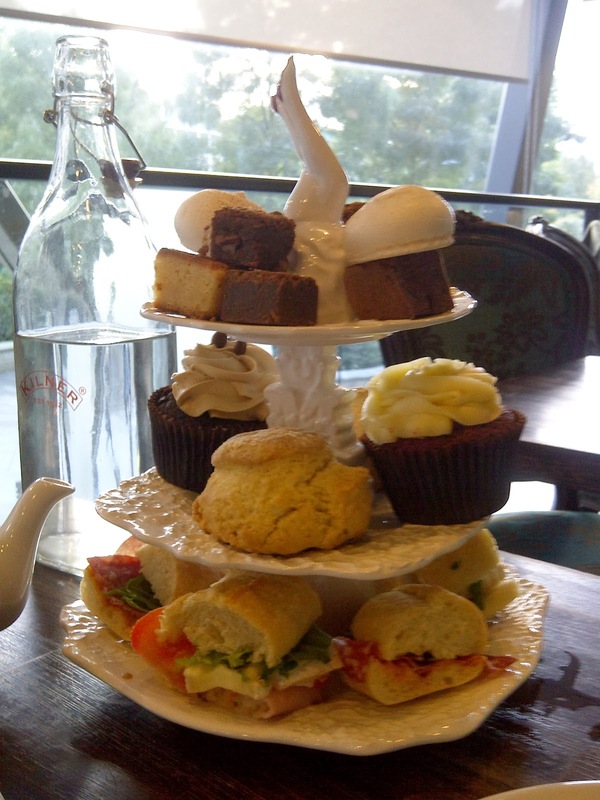 On a relevant note regarding afternoon tea, I also met up with my friend CW at Bea's of Bloomsbury's St. Paul's location earlier that week, so I want to briefly share that experience. While the sandwiches were delectable, the pastries were extremely disappointing. The cupcakes and brownies taste as if they came straight from boxes of overly sweetened cake-mixes. The service was also quite negligent. The experience was definitely not worth the £19. Returning to the day of the musical, we arrived at Novello Theatre about 10 minutes before the 7:45pm show. The theatre's interior is beautifully ornate. Needless to say, the musical was fantastic even if the sound quality had some highs-and-lows during the show. After all, Mamma Mia! was born in London's West End. I highly recommend it. After the musical wrapped up after 10pm, we dove through pouring rain for a late night snack at Shake Shack in Covent Garden. I have put off visiting this burger place (and Five Guys) since the queues during regular meal times are always beyond my patience. The ShackBurger I had was good, but I would never queue for it. Be sure to check seats allocations and prices for different packages. Tickets are reserved for 15 minutes before releasing to the next order, so there is time to compare options. Sometimes you can find an unexpected deal as I did. If your package comes with a complimentary dinner/afternoon tea/cocktail/etc., be sure to phone ahead and verify the valid period of your voucher. I was told that my complimentary afternoon tea was only valid on the same day as the musical. If you only plan on seeing the musical, you could just pick up the tickets right before the show at the theatre location.